What did you do before coming to Le Cordon Bleu Paris? Nazlı - I studied gastronomy and culinary arts in Yeditepe University for 4 years in Turkey. I graduated in 2012 and was the best student in the gastronomy and culinary arts department and the Fine Arts Faculty. Upon graduation I decided that I wanted to learn pastry because of the two internships I carried out during my studies at the university. Because the education I got at the university was not very hands-on, I decided to apply to Le Cordon Bleu Paris to learn from French Chefs and because lectures are in English. I also wanted to be in Paris, in France, because it is the centre of the gastronomic world. I did not speak French at the time and now I understand everything in the kitchen! What is your best memory at the school? Nazlı - First of all, my internship at Pierre Hermé’s. This Chef was my idol, I have all his books. Having the opportunity to carry out an internship with him was incredible. I would not have been able to get such an opportunity if I had not been a student of Le Cordon Bleu Paris. Another great memory was to assist Chef Nicolas Jordan to prepare his MOF semi-finals. I got to work with him and he did not hide anything of the training process: measures, preparing the moulds, assisting during the preparations… It was a real experience I will not forget. You now own a Chocolaterie in Istanbul: Nazenin İstanbul Chocolate. How did you become a chocolate maker? Nazlı - I had this last class on chocolates with Chef Jean-François Deguignet and I loved it. I thought chocolate was something to do in Turkey because pastry is not so developed. There are traditional cakes and European pastries in Turkey but people don’t really understand the complex flavours and they think it is heavy. This is the reason why I stopped pastry and decided to make chocolate. For a pastry shop, you need more products, a bigger investment and the shelf lives of the products are shorter compared to chocolate. Chocolate was the best option to enter the Turkish market for me. How important was the training you received at Le Cordon Bleu Paris to achieve your goal? 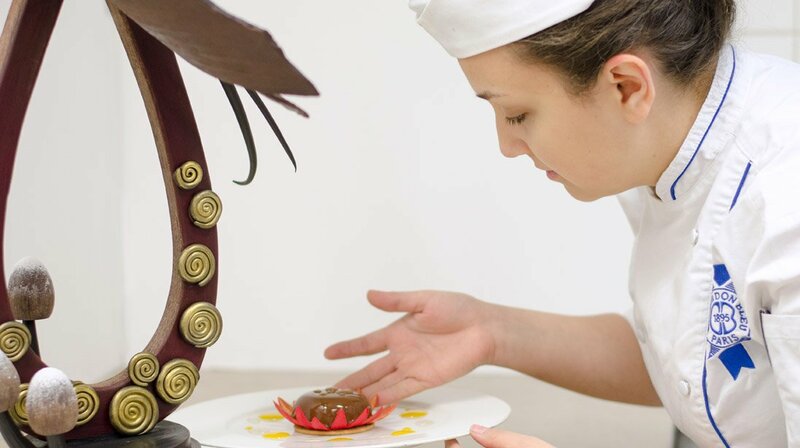 Nazlı – The courses and training I received at Le Cordon Bleu Paris was very helpful. I learnt the basics and the logic behind chocolate making. I learnt how to handle the product and the technique. What is great with chocolate is that you can create your own recipe and use a technique of yours when you know the logic behind the art of chocolate. What is the hardest thing about working with chocolate? Chef Nicolas Jordan – The hardest thing is both the texture of the ingredients and the colours. Harmony is essential. For Nazlı’s competition, the chocolate piece and the chocolate dessert must work together. We have used gold and red elements for the chocolate piece so that it reflects the plate on which the dessert is presented. All the items presented must be harmonious. How did you enter the Turkish selection for the coupe du monde de pâtisserie? Nazlı - I actually applied! A professional contact mentioned this competition and recommended me to apply. The jury selected 4 people to compete during the Turkish selection for the coupe du monde de patisserie during the SIRHA Istanbul. I wanted to train hard and prepare myself with one of Le Cordon Bleu’s best Chefs and I was lucky because Chef Jordan was available at the time. How long do you have to prepare all the pieces during the competition? Nazlı - I have 6 hours to prepare the chocolate piece, 2 frozen entremets and 8 desserts. What would be the best advice you could give to somebody to help them to be fully prepared for a competition? Chef Nicolas Jordan – The best advice would be to be prepared and make sure your ingredient preparation is well done. The most important thing is to be well organized. Nazlı must make everything during the competition. It is therefore very important that the ingredient preparation has been well done.